Celebrate the new year with party hats and champagne! 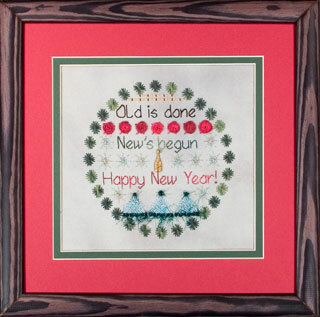 This fun sampler has black-eyed peas for good luck, roses for the parades and bowl games, fireworks, and party hats in a circular design. 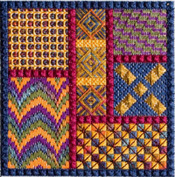 Crescent Colours, Kreinik #4 Braid and Blending Filament, and Rainbow Gallery Arctic Rays are used for some fun stitches - Rhodes octagons, half-queen, spider web roses, sprat's head, couching, French knots, star variations, and back stitch, all completely illustrated with large stitch diagrams. A champagne bottle charm finishes the design, about 5 ½" diameter, 76 x 76 stitches. Shown on 28 ct. Stormy Gray hand-dyed Jobelan, or can be worked on 14 ct. fabric. See how much fun you can have with Counted Canvas! !